Just got back into town and saw the Zingo sticker. Many thanks to Mr. Spradlin for posting that. Now, does anyone have a Quadraphonic KMOD sticker? Thanks Mike for the info on KLOT. I remember some of those names that you mentioned. Maybe we'll get lucky and one of them will post something on this site. I thought I might update everyone on some former local television personalities and their current locations for those who may be curious. Former Sports on 6 reporter Bob Slovak is now at ABC 13 in Houston as a weekend sports anchor. Former 2News NBC Anchor Jay Rickerts works for Williams on the Energynewslive.com webcast, which is done right here in Tulsa. Former KOTV Weekend Sports Anchor Jon Anderson is on ESPN Sportscenter, usually on the 1 a.m. show. He refers to the Tulsa Drillers on-air whenever showing highlights of a "former Driller", as he puts it. I would also like to say that it would be nice if KOKI's new location provided an opportunity for some sort of new local television in Tulsa. That sort of thing is rare anymore. As someone who was on-air here in town, during my late high school days, I treasure how entertaining good local television can be. I am also very happy to have been only a very small part of Tulsa television history. In college, at Oklahoma State University, I had the pleasure of co-creating, executive producing, and hosting OSU's first local TV show (http://www.ocolly.com/issues/2000_Spring/000121/Stories/comedy.html). Even though the show only lasted 4 episodes, everyone enjoyed their part. It brought a bit of creativity to Stillwater Television, which was lacking big time. KWEM-LP is Payne County's only local station. 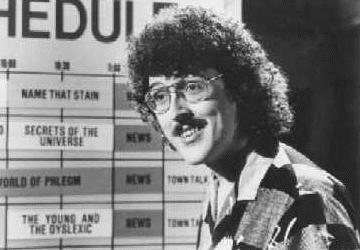 It makes Weird Al's UHF look like NBC. The station was located inside the old University Theater, next to the current location of Hideaway Pizza. I was hired on there during its startup period as a news reporter for its weekend newscast. The station's attempt at news fizzled after about a month due to poor organization. This can be attributed to the management because they failed to pay or give internship credit to students who worked at the station. By asking for students to volunteer and not paying them it seemed like a perfect business. Soon the OSU School of Journalism and Broadcasting discouraged students from participating after they got wind of the station's practices. Basically it was a big lawsuit waiting to happen. Most of us student journalists never made it on-air at the station. After a failed attempt at a professional newscast, after hiring non-amateur talent, KWEM's "News Division" closed its doors. KWEM moved to the campus of Langston University in early 2000. The famed University Theater, which housed KWEMs early days, was demolished last summer to make room for Hideaway's expansion. I believe that local television should be returned to our airwaves here in Tulsa. Leaving local television to be put on by low-powered stations is too much of a hurdle in making it profitable. My experiences at KLOT and KWEM are both examples of why it tends to fail. I am interested in what other people think of the current state of local television in Tulsa. I wouldn't be surprised if Rex Daugherty, former KOTV reporter and contributor to this site, is involved with the Williams webcast. The site has many photos and the history about the ride. I haven't ridden it in over 14+ years. I'm kind of bummed that Bell's took out the "dips" in the ride (especally that first one in the dark!) that were causing the cars to stall, or bump each other on the track! Thanks for the research, Billy...good one on Phantasmagoria. You old-timers know Alexander Scourby, the great narrator and announcer. I was very surprised to see that there was a movie on the AMC channel on June 6th called The Glory Brigade in which Scourby co-starred with Victor Mature. The film, which was about the Korean War, was made in 1953. Scourby played the role of a Greek infantry officer in the United Nations army. He not only spoke English with a perfect Greek accent, but also spoke Greek throughout much of the movie, all in that beautiful voice, of course. I didnt know that Scourby had a movie career. Maybe this one film was it. This search in the Internet Movie Database credits him with many movie and TV appearances. Maybe I can answer some of the questions about Fox doing news in Tulsa, since I work there. It is a fact that the Fox and UPN TV stations as well as all the Clear Channel radio stations are moving out to what used to be the Burlington Coat Factory building (aka Oertle's...webmaster). The tower in front of the building was erected over the weekend. No one is sure when the move will take place exactly because the contractors ran into having to remove asbestos and various other snags when they began the renovation. The plan does include a 9 o'clock newscast at the point when everyone is moved in. Clear Channel is doing much the same thing in other markets where they have a Fox affiliate, Minneapolis was the most recent. We just had to wait our turn on the buildout schedule. The facility will include a news studio, a production studio, and an exhibition-hall-type thing. I worked at KTUL during the 80's and enjoy your website. Everyone will be welcome to come and check out the new building when it's done. I'll be lookin' for ya! Thanks, Charlie, we'll definitely take you up on that. "New UHF Station Ready For Tulsa's Airwaves" by John Wooley from the 6/1/1997 Tulsa World. KLOT = "Lots of Tulsa TV", according to the World article published the same day KLOT signed on for the first time: 6/1/1997. There were plans for call-in shows to feature an attorney, a psychic and a family therapist. A Spanish-language show was to have been produced by Wayne Ford of "Christina's International" (remember him hoarsely touting "beautiful Peruvian jungle girls" as brides late at night on TCI Cable?) There was to have been a modern-day "Tulsa Teen Town Topics" in the form of "High on Teens", another call-in program. "Talk to Me With Sam Jones" was proposed to be the flagship, reuniting Sam with the Sonny Gray Trio. KLOT was on Channel 25 from about June of 1997 till maybe August of that year. It was started by Tim Oliver (Just After Midnight). There was a full page article in the Tulsa World about KLOT a couple of weeks before its debut. Oliver wanted the station to fill its airtime with all local television. His biggest show was to be the new Sam Jones program, after it was cancelled by KOTV. Oliver was supposed to have a kids show, a late night comedy program, and other local only productions shot at KLOT studios on 15th street. However the A1 Network (America One Network) took up the vast majority of KLOT's programming hours. I had just graduated from high school at this time, and had just gotten through working on and hosting an updated version of Jenks High School's television show "Hi Jenks." Stephen Lassiter (Executive Producer of Hi, Jenks) and I pitched the same sort of show to Tim, but were instead hired on as "Interns" for the late night comedy show. To make a long story short, KLOT never seemed to have much of its act together in getting local programming off the ground, besides the Sam Jones show that I know of. The elaborate set construction that was going in this studio proved to be very time consuming. Not to mention the fact the equipment was very old and not quite up to par in running a television station. The idea was a great one and with a little more funding KLOT probably could have gotten off the ground. The low powered signal on UHF 25 kept it from being seen by too many people. I remember bringing a handheld tv to a Drillers game and being able to see and hear the signal clearly. But when I moved out to South Tulsa, the signal was awful. I don't know of that many people who saw it to be honest. But I do know that Sam Jones was involved for a while along with former KJRH Weatherman Gary Shore. I am curious along with my friend Bobby in learning the fate of what happened to KLOT. I eventually quit my "internship" there after about a week and a half, because the station was going nowhere rather fast. I do remember Just After Midnight. They did have some sort of movie review show, that was to be aired on KLOT too. If someone could access the Tulsa World's archives. The story about KLOT was posted in either May or June of 1997 in a Sunday edition. I've searched the message board on this site and have seen no one else who was a part of KLOT ever posting on this site. I would love to see what finally happened to good old KLOT. I also share Bobby's curiosity on what happened to former Z104.5 the Edge's Ernie and Jane. They just seemingly vanished from Tulsa radio. The other recent postee who asked about Fox 23 getting news, I do know this. Clear Channel purchased the Old Burlington Coat Factory location at I-44 and Memorial. An article in the World said they were wanting to create state of the art television and radio studios in this building after it was first renovated. That would combine their tv and radio prescence to one site. But as far as Fox 23 news, it has just been a rumor on my end too. I know a lot of people in Tulsa TV News, and they've been hearing the same rumor for about 4-5 years. I'll post more if I have it later. A discussion on AOL between a friend of mine and I about Tulsa Tv produced even more questions and some answers visitors may have when they visit this site. Whatever happened to soccer player Charlie Mitchell? I remember all his restaurants closing down one by one across Tulsa. For those of you wanting to know what happened to Bob Healey. . .he was in Springfield, MO. on KOLR as a news anchor. I'm not sure if he's still there or not. I was also curious of the whereabouts of Linda Soundtrak and Doc Rock. My friend also wanted me to pass along the passing of former Z104.5 DJ Hondo. He died of an apparent drug overdose in Phoenix this Spring. Former News on 6 Sports Director Scott Higgins was spotted by my friend on the PIN Network (Cox-70) doing a testimonial in an infomerical on hair loss. Doc Rock has been inquired after several times, but we don't know his whereabouts yet. However, in Guestbook 3, we got an update on Linda (Verin) Soundtrak from Jim Back. The most recent thing I could find on Charlie Mitchell: he is/was head soccer coach at Northeastern State University in Tahlequah. He can be seen at the top of The Sports Page on this site. I heard a rumor from one of my TV friends in Tulsa that Fox was starting news soon. Is this true? Last weekend, I was in Tulsa and saw the UPN girls, they are straight up hot! Where did they land those girls? For those of you wondering what happened to Aaron Tuttle, he no longers works at 8. Apparently they couldn't agree on a contract. How did you find TTM? Ah, yes, I did indeed catch "Just After Midnight" (and an earlier program, "Urban Almanac"). As I recall, there were regular comedy bits, like a Tom Waits-ish piano player, throughout the show. Local bands were also featured at length. I contemplated going out to see this show taped, but missed my chance. Wasn't this show somehow affiliated with a video store over on South Harvard, and didn't it have movie reviews, too? I saw a mention on the internet of KLOT as Channel 25. So it was one of the low-power stations? How far did its signal reach? How did you find out it was on the air? Whatever became of the old KLOT? I remember watching it, and the signal barely reaching my house? Whatever happened to Sam Jones? Has he left Tulsa television? If anyone has answers to these questions, please post them, I will check back often. Hi, Bobby...Gary Shore information is at the top of Guestbook 8. We really haven't had a definitive update on Sam Jones. I must confess I haven't heard of KLOT. Anyone else? The motion picture "UHF" has come in for attention on this web site. It happens that WGN Chicago is scheduled to telecast the movie from 7:00 to 9:00 p.m. tonight (Saturday, June 9), Central Daylight Time. WGN is on a great many cable systems around the country and is available in Tulsa on Cox cable 4. Well, thanks for noticing that, Don, I would have missed it. This is a chance to get a copy without paying big bucks on eBay or waiting for the DVD. I remember by the early 80's the Golden Driller was in disrepair and looked very ugly (with the paint flaking off and a big hole in one of his boots.) I remember a story on TV where the management of Expo Square was going to remove it, causing a BIG public outcry and leading it to be restored. As for Bell's I spent a LOT of weekends there with buddies. Zingo never failed to make our girlfriends and younger siblings scream! (We're gonna DIE!!....Yaaaaaaaaah!) I have rode other Roller Coasters over the years that were faster or flipped me around in all directions but Zingo remains my favorite, probably because its the one I rode the most! See Billy's note a couple down from here...he also sent a picture of a KELi bumpersticker! I remember those free rides for A's also, and several years later, after playing Bell's miniature golf course, my bunch would toss their golf balls into a little machine and get something free, usually a ride or food. Occasionally, someone would get a free "Zingo" coupon, but we usually played golf after they closed it for the evening (after 9, I think, due to a court ruling in favor of some sleepless neighbors), so they usually went unused. One of my favorite rides at Bell's was a simple "sailcar" ride that sat on top of the nearby concession stand before they replaced it with the dome theater. It would spin around, and by turning a rudder on the car, you would either sail out away from the ride or come in closer. Very nice way to cool off on hot summer nights in the early eighties. Alas, one icon of the nearby Tulsa Fairgrounds that I never could stand was that Tulsa Driller, which never looked anything but coyote-ugggggly to me. (Please, nobody hit me!) Sorry, I guess that came from not being an Oklahoma native. The Golden Driller isn't likely to be mistaken for a long-lost Michelangelo. I'd like to see a 900' Tuffy. Joe Robertson and Lee Woodward remembered the free rides for "A's" on report cards promotion at Bell's Amusement Park in Guestbook 51. Just a quick note to say I loved looking at the website! Wow...!! I spent my teenage years in Bartlesville in the mid 70's-early 80's and grew up listening to KAKC (AM & FM..whatever happened to Captain Fantastic and Dr. Dawn? ), KELi (Jonathan Apple, Charlie Derek), KKUL (later KTFX - The Superfox and "Crazy Steve"), and also KMOD, KWEN (in their short lived Top 40 days in 1980-81) and KAYI (K-107). I have fond memories listening to all these stations, and remember feeling very sad to hear the news that KAKC went "off their rocker" in early 1978. 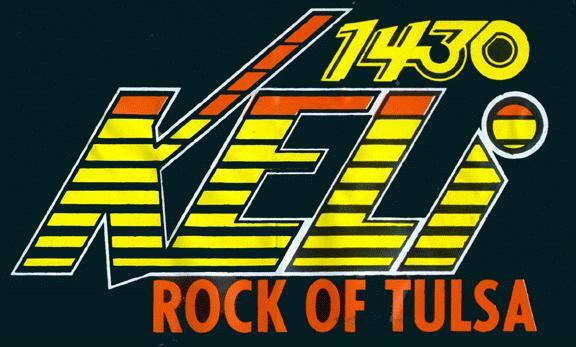 I spent 17 working in radio, in fact it was a visit to KELi's studios at the 1975 Tulsa State Fair that inspired me to become a DJ! (wrong move, right?) I never worked in Tulsa but have worked at stations in Pawhuska, Claremore, Wichita Kansas and "down here" in East Texas. I have a couple of KELi bumper stickers and surveys from the late 70's I can scan if anyone is interested. Also I have a KAKC "Solid Gold" LP on Post Records that I picked up at a thrift store in the early 80's. Can anyone tell me when this was released? You're welcome, Billy...Lowell Burch mentioned owning a copy of the Solid Gold record and seeing one sitting next to Lee Bayley (who just signed in again!) during KOTV's 50th anniversary reunion back in Guestbook 28. Maybe one of these gentlemen can put a date on it for you. I notice that a couple of recent visitors have found the site via Google.com. It is the best search engine out there, in my opinion...just a plug from personal experience. I just wanted to update you with a new email address. Since finding you a couple of years ago I have received some very nice messages from old friends, KAKC listeners, and Channel 6 Dance Party people. It is nice to have that connection. Thanks, Lee, I changed the email address on your previous entries as well. Here is the Tom Gordon page on TTM. In case you missed it on the Bulletin Board, you can read on this site an interview with David by Wilhelm Murg for Cool and Strange Music! Magazine. Just saw Gary Busey being interviewed in a heavy metal magazine...I don't know why. It was on the stands at Hastings. I don't recall the exact title, Metal Storm, Metal Hit, Metal Klang, Metal Poisoning, Metal Fatigue, Metal Pudding,...I'll get the facts and disseminate accordingly. I used to have a newspaper clipping that had the "TU23A" logo. If I can track it down (yeah, right) I'll get it sent to Der Webmeister. How did you find TTM? How long do you have? "[I spent much of 1961] in Bartlesville, Oklahoma...working on one of the first pay-TV systems in the United States. The project was the joint effort of Jerrold [Electronics, a cable and set antenna pioneer] and Henry Griffing. Griffing had chosen Bartlesville because it was within the coverage area of three Tulsa network stations. If a cable system could make it there, it could make it anywhere, and he would be the first to know. "Bartlesville proved premature, but not a failure...."
The book is called "Take the Measure of the Man." We sometimes forget how far we've come in a relatively few years. There was a lot of talk here a while back about the movie UHF. Well, I just read on Digital Bits that there will be a DVD release of it either late this year or early next. How did you find TTM? My son in OKC sent it to me. I lived in Tulsa from 1960 until 1996. I retired and moved back "home" where I graduated from high school. This page brought back many, many memories. Thank you. I remember less of Channel 41's programming; I think it took them longer to catch on. My most enduring memory of those two stations is the unbearably bright blue strobes they initially used on their two transmitter towers, located between Broken Arrow and Coweta (near my former home). The out-of-synch flashes they put off looked like constant lightning in the sky. After a barrage of complaints from the locals, they toned them down. Channel 8's red-lit tower was out east of them long before, and I think 2 and 6 now share another tower, south of the others. As also noted here previously by Erick, the logo looked like "TU23A" , and was on the packaging (blue and gold?) of the free hoop antennas (or "antennae") available at Quik-Trip...hey, is that where Ricardo gets his "Tussa" reference? Jim Reid and others have talked about Channel 41...try "KGCT" in the search engine. Sooner or later, I'll collect those comments on a new page. My constant companion, the trusty TV Factbook, says KOKI Channel 23 went on October 26, 1980, and KTFO Channel 41 kicked off March 18, 1981. I know they weren't there when I left town, just ahead of the tar and feathers, in March, 1979. Thanks for that, John. 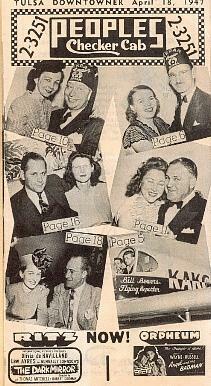 I believe 41 started life as KGCT (Green Country Television). When did KOKI, UHF Channel 23 sign on...was it the late 70s or the early 80s? Same question about KGCT, Channel 41. I have just placed a list of local TV stations on the Links page along with links to their web sites, and comments about local programs. Let me know if I have missed anything or if there are changes. Just heard - former long-time KOCO anchor in OKC in the 80's, Mary Ruth Carleton has a new job! She was at Holy Names College in San Francisco but now will be Assistant Vice President for University Advancement at the University of San Francisco! There IS life after TV! 6/3: Don Duca just responded to a Lee Woodward note at the top of Guestbook 75. 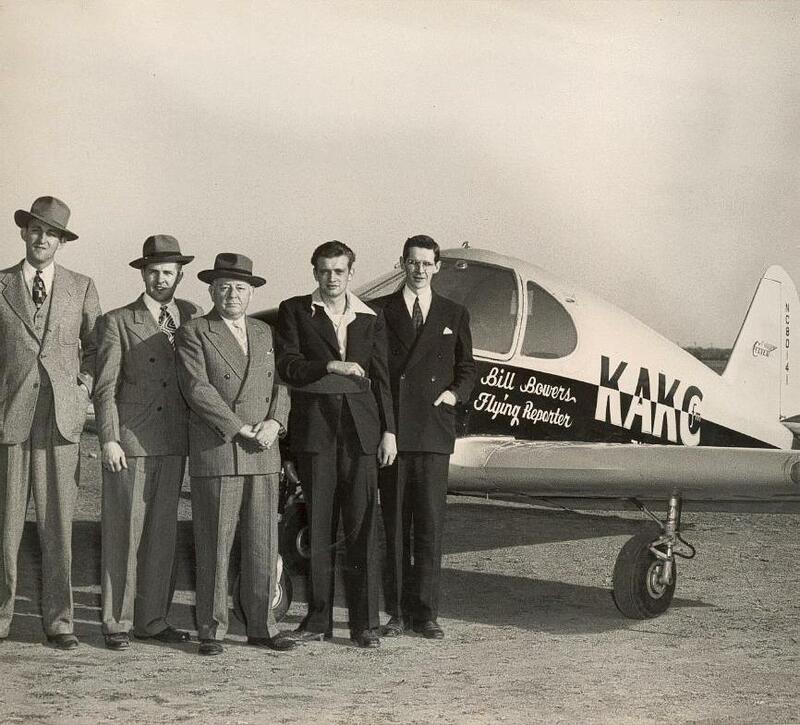 Bill Bowers sent this cover of a 1947 Tulsa Downtowner magazine in an attempt to date his earlier pictures of the KAKC plane. It features ads for the Ritz and the Orpheum Theaters, and the Peoples Checker Cab. I just think the World will eventually scrap this ill-advised move. A few years ago in the early days of the web, the New York Times threatened to convert to pay-to-read but they backed off when they saw no one else was doing it and there was plenty of free stuff to compete with it. Only a very few national publications do this today and I don't know of any local-level papers that do. When the World sees that the dollars aren't coming in from subscribers, they'll realize that their site is going unread and go back to a free site like everyone else.. Let's hope. If you subscribe to the Tulsa World, you will need to register to be able to look at their web site, http://tulsaworld.com. To get interim access now, use the "Cannot locate my last bill" option. If you are not a subscriber, there is now a charge to access stories on their web site. Not getting enough hours of "The Simpsons"on Fox? If Harry Pappas launches TV Azteca USA, I wonder if we will be able to see Homer in Spanish here? I actually grew up with Schlotzky's. My mom was a store manager and later district manager in the mid 80's. She left just as they were beginning to expand to self-designed, free-standing units in the early 90's. I still enjoy a small Original from time to time at the downtown shop. Schlotzsky's - I first went to one in Amarillo then we had them in OKC 16-18 years ago - first foray in OKC by the Austin company. We loved them. Then they rented old store fronts for "character" and lower rent - later they built stores from the ground up. Ditto Grandy's fried foods - read chicken fried steak and bodacious cinnamon rolls for breakfast - was a hit in OKC. They "don't play" on the East Coast though. DC has *1* Schlotzsky's and after a lot of radio ad time - still has one. Though I have seen them partnered in mega-gas stations on the East Coast - you know with gas/7-11/Dunkin Donuts with a Schlotzsky's or Subway sandwich shop. As for Grandy's- we had 1 in Manassas, VA and it failed - in OKC the North Side 16-18 years ago - Grandy's locations enlarged several of my co-workers waist-lines. Popeye was the nickname of the man who started Popeye's Chicken. Early on he secured rights to use the Popeye characters for advertising. I remember the Raft promo. It was very interesting and memorable from both an aesthetic and technical standpoint. The old ballpark and the seal of approval on the opening page were both very good. Hey, I read a few minutes ago about Krispy Kreme Donuts here. Read today's paper (5/31) in the business section. I may have sent the last message too soon. I have no idea why Popeye's Chicken left Tulsa. Remember Schlotzsky's also left about the same time (but of course came back.) I read awhile back Popeye's has nothing to do the cartoon. It was for Popeye Doyle. Ed O'Neill played him in a movie back in the 70's/early 80's. On another subject, I wish Safeway would come back to Oklahoma. Homeland is a joke compared to them. Oops!!! Let's date those photos of the airplane and Tulsa as either late 1945 or early 1946. In digging through the pictures taken that day, I discovered there are others in the group that show the top of the National Bank of Tulsa building WITHOUT the KOTV antenna being mounted there. Just corrected my note below. How great that people still remember some of the promotional things we did over the years. Here's a little background on, "Channel 8's Raft of Good Movies" promo. It was one of the first things I ever did. David Banks brought the movie, "Every Night At Eight," to my attention thinking that maybe we could use that title to our (8's) advantage. I viewed the film and found a scene of George Raft doing an ever-so-smooth dance routine just to the left of frame. I think he was actually leading a band to the right of screen, but he stayed to the left for at least 30 seconds and ended with a full twist and nod. His position in the film was was most important because at the time (early 70's) we had no way of moving any video source around to where we ideally would like for it to be. However, we could split the screen and insert a second source to the right. In this case, the switching of this spot became a major feat. In 30 seconds, Glen Blake had to roll film chains, take at least 4-5 studio camera shots (live, light-box graphic shots) and make it all sync-up to the Ramsey Lewis hit, "The In Crowd." with me yelling, "Take it! Take it!" It probably doesn't sound like much now, but then we thought it was a monumental achievement. I talked with Glen last night and he did recall the spot and the tag line as voiced by Cy Tuma: "Channel 8. . . a Raft of Good Movies . . . by George." The original discussion of this promo is in the previous Guestbook (#80). For those joining us late, Carl is also known as "Uncle Zeb"! His promotional genius is responsible for "8's The Place" as well. 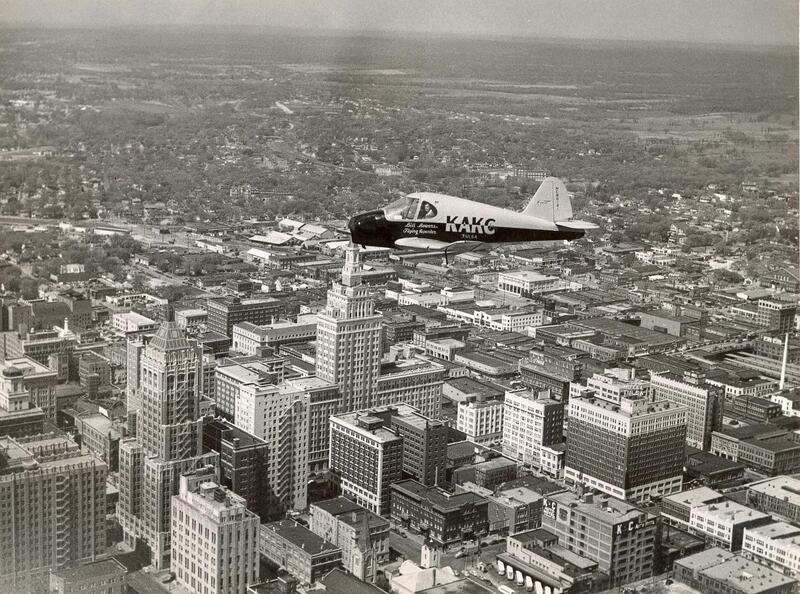 Bill Bowers just sent in two pictures of the KAKC airplane taken in late 1945 or early 1946, on the ground with Bill, the "C" of KAKC and other gentlemen, and in the air over downtown Tulsa. The aerial shot is a large file to download, but it is an amazing photo. "The people from left to right are Bud Maupin (Chief engineer)...Jim Crosby (Sales dept. )...Glen Condon (Part owner and manager).....Me (Bill Bowers)....and Jim Neal (Assistant Mgr.)" "...By the way, it was my plane but Glen Condon, Jim Neal and I thought it would make a good promotion. Jim Neal and I covered the Woodward tornado aftermath from the air. We couldn't land at the storm-damaged Woodward airport so I had to fly back nonstop. Jim was carrying the "Sound Mirror" tape recorder on his lap all the way, and we darned near had to carry him from the airplane when we got back. His legs were asleep from the weight." What memories, however most of ours were with radio days. Frank was at KVOO while still at TU, signing on and sometimes signing off. Frank did the daily remotes from Cain's with Johnny Lee Wills, as well as the Saturday night hour at Cain's. He and Walter Teas wrote and performed "Eggs at Eight" until we moved to the East coast in late 1952. "Eggs at Eight" has been mentioned here several times, notably in Guestbook 19 by Bill Hyden, in GB 22 by Frank Morrow and in GB 27 by Jim Ruddle, where a picture of the group can be seen. The Cy Tuma page also has the picture and some of the Guestbook commentary. Thank you, Jeanne, for paying us a visit this morning. How did you find TTM? Rich with Technical, Trivial and Marvelous information. When we got our first TV it had two dials, VHF and UHF. 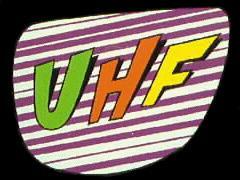 I could not believe that the UHF had so many numbers, especially when none of them received a signal. Back in the days of three channels, I wondered if there would ever be a day when there really would be a hundred or more stations available for viewing. Nah, never will happen. Don Norton had just reminded us of KCEB, Tulsa's nearly forgotten first UHF station. Popeye cartoons and chicken were salivated over, along with many other fast food franchises and grocery stores. John Hillis found his comments about Dr Nut, Safeway and Community Coffee profusely illustrated by the webmaster. "A Raft of great movies, by George!" was a vividly remembered Channel 8 promo. Radio news readers and commentators were discussed. Mayfest music was reviewed. We heard again from the Tincher family and from Bill Bowers and Gary Thompson for the first time. Back to Tulsa TV Memories.